At 7.00 PM one more program was organized at Gokul Colony Indore as program under RWAs. Our whole team along with Transit exhibition reached Gokul colony part and interacted with residents. 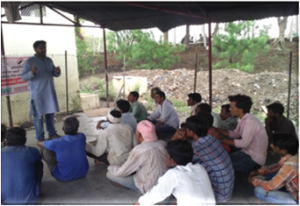 The program was widely appreciated and proved very beneficial for the stake holders. 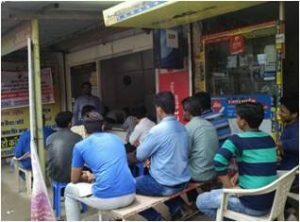 MPVS has organized one program in association with Pratyaksh Seva Samiti at Khajrana Market in which 20 Dealers of electronic items were participated. 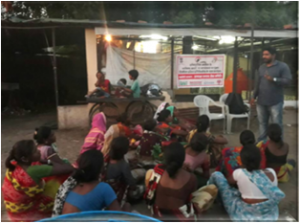 Same day 2 more program were organized in association with Pratyaksh Seva Samiti : with Rag pickers. Apart from lecture and discussion of various aspects of E-waste management, a poster exhibition also organized. The program was highly appreciated by participants and pledged their whole heart support for this campaign.